The search for a successor to David Quinn as Terriers head coach appears to be in its final stages. Last month, Quinn was named head coach of the New York Rangers, signing a five-year contract reportedly for $12 million. While nothing official about the search process has been revealed by BU’s Athletic Department, there have been media reports and numerous tweets suggesting who the finalists may be. 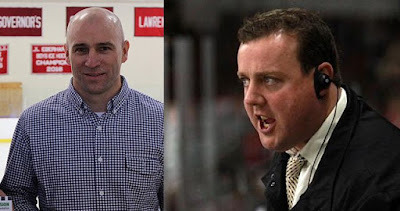 Among the names being mentioned prominently are Associate Head Coach Albie O’Connell (right), former BU All-American and current Rivers School Head Coach Shawn McEachern (left), Bruins assistants Joe Sacco and Jay Pandolfo and Union Head Coach Rick Bennett. ● Boston Globe Next BU coach comes down to McEachern or Bennett? I keep hearing BU admin wants a guy who will be in it for long haul. Albie O’Connell is a BU alum. Wife is BU alum. From the Boston area. Worked extremely hard at smaller schools to get back to BU as assistant. Great personality that recruits/players/donors can all relate to. Brady Tkachuk’s Draft Diary covers strength tests at last week’s NHL Combine in Buffalo. 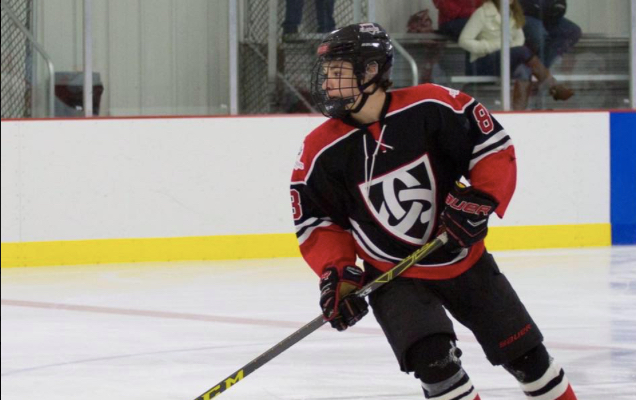 2020 recruit Josh Lawrence was select in the first round—15th overall—of the QMJHL draft by St. John’s this past weekend. The Fredricton, New Brunswick native scored 83 points (27G, 56A) for the Selects Academy 16Us this past season.